How to have an adventurous 10-day, 2500-kilometre road trip following the Warlu Way from Broome to Exmouth, with some luxury along the way. Our odyssey begins in Broome and takes us initially to Eighty Mile Beach, a 360-kilometre drive along the coastal plain, where we spend our first starlit night at the caravan park, sheltered behind shell-strewn dunes. The next morning we cut inland to Marble Bar, a mining settlement dubbed “the hottest town in Australia”. For 161 consecutive days in 1923/1924, the temperature here remained above 37.8 degrees. When we arrive at lunchtime, it is a degree hotter than that, so we retreat to the Ironclad Hotel, built in 1892 to cater to thirsty miners. The only other patron is old-timer ‘Bung’, who looks like he hasn’t left the bar in years. We understand Bung’s torpor when we spend the night in Doolena Gorge, a short drive to the north. It is hot, dry, undisturbed by other visitors and mesmerising, especially when the setting sun ignites its red rock walls and cloaks the gorge in echoing shadows. 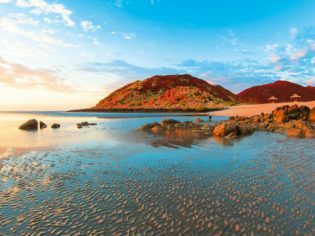 Over the next few days we journey along the Pilbara coast, searching out unspoilt corners away from Port Hedland and Karratha, towns at the centre of the region’s thriving iron ore, gas and oil industries. At Point Samson, we discover the laid-back antidote to the industry and inland heat. If Broome circa 1990 was recreated on the Pilbara coast then this seaside resort would be it. We settle into the spotless Cove Holiday Village caravan park, swim in warm tropical waters off Honeymoon Cove and wonder, while having lunch on the verandah of Samson Beach Tavern, if we’ll ever leave. When we do two days later, it is to visit the nearby historic towns of Roebourne and Cossack. Here, at museums in Roebourne’s Old Gaol and Cossack’s Courthouse, we discover the area’s past as a pearling and gold mining centre and learn about the shameful treatment of local Aborigines who were forced to free-dive for pearls little over a century ago. Later, we find our way to Deep Gorge on the Burrup Peninsula, north of Karratha. Etched on hillside boulders are 10,000 petroglyphs depicting creatures like thylacines (extinct here for 4000 years), emus and turtles. It is one of Australia’s most important indigenous art sites, but we have it to ourselves. Almost as deserted is Hearson’s Cove, a broad slather of caramel-coloured sand beneath the rock engravings. Parking up behind the beach, we pull a bottle of West Australian white out of the campervan fridge, barbecue some fresh prawns and decide to stay overnight. Sitting beside a roaring fire, with the ancient art behind us and a star-spangled sky above, it is an unforgettable night. The next day, we move inland and arrive at Deep Reach Pool in the Millstream-Chichester National Park at the mid-point of our 10-day journey from Broome to Exmouth. After the hot three-hour drive from the Pilbara coast, travelling through spinifex-covered hills and past huge mesas rearing out of the red desert, we are amazed to discover this deep waterway, lined by paperbark trees. The campervan’s engine has not stopped humming before we are immersed in the pool’s cool waters. For the next half-hour we have Deep Reach Pool to ourselves. As the olive-green water gathers reflections in the late afternoon, we drift through amplifications of the cobalt Pilbara sky and overhanging greenery. Even the corellas in nearby trees seem transfixed, barely moving from their perches. Bang! The corellas erupt skyward in a squawking plume. Other people have arrived and, with the slamming of their car door, snatched us back from heaven. The rest of our two-day stay at Millstream-Chichester is suffused with similar moments of tranquillity and spirituality. Nhanggangunha (Deep Reach Pool) is one of the most significant indigenous sites in north-west Australia, the place where the creation spirit serpent or Warlu is believed to live. It is the legend of this sea serpent, emerging from the ocean to cross the barren land while laying down waterways, that inspired the 2500-kilometre Warlu Way. Whatever direction you do this drive, either from Exmouth to Broome or vice-versa, the desert oases of Millstream-Chichester National Park lie at the journey’s heart. After two days, we journey onto Karijini National Park, 150 kilometres south-east of here. Karijini’s plunging chasms and swimming holes established it as our favourite Australian national park. Each day follows the same pattern of gorge walks and swims in natural pools. We start at Hamersley, a broad fissure that drops down from a plateau in a series of small falls and blue-green pools. Bands of coloured rock, from ruby to light sapphire run through the gorge walls and beneath them there’s a fern-fringed swimming hole. Above it is a hidden grotto, hollowed out of the rock face. Bubbling with sweet-tasting freshwater, it’s an irresistible natural jacuzzi. Our accommodation – in an en-suite tent at Karijini Eco Retreat – allows us to explore the bowl-like Joffre Gorge behind the retreat. It is soon time to move on again to Exmouth, on the state’s north-western tip, a full day’s drive away. Although Exmouth marks the end of our 2500-kilometre drive, the Warlu Way has one more highlight in store: swimming with whale sharks off Ningaloo Reef. Having made an epic journey inspired by a mythical sea serpent, it seems apt to conclude it by encountering not only the planet’s largest fish but one of its oldest surviving creatures, which first appeared 65 million years ago. 4WD campervan for national parks, around Marble Bar and for overnight stays in remote spots like Doolena Gorge.